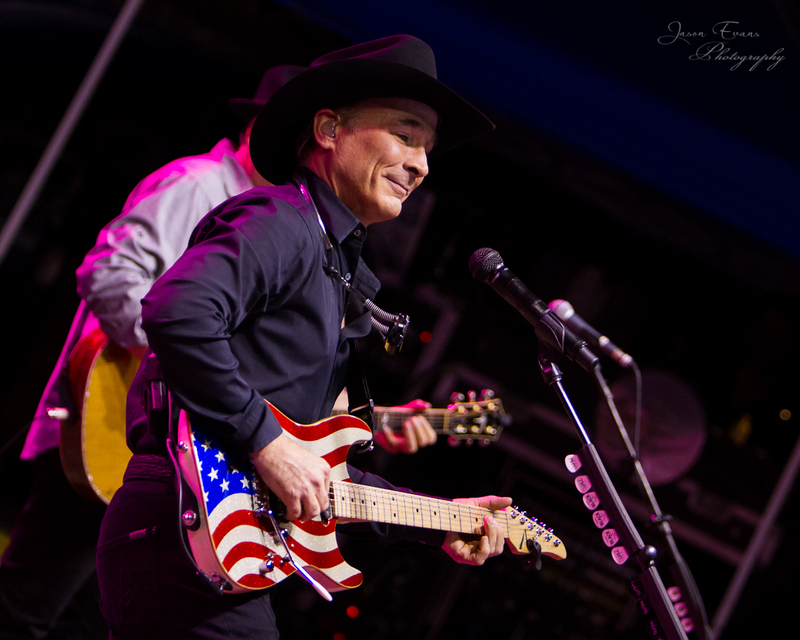 Country music gentleman Clint Black hasn't been "Killin' Time" as of late, he's been busy mentoring the Chideo Songwriting Contest winners, recording new music and picking up a new touring schedule. Tonight's stop was JD Legends in Franklin, OH and the place was packed shoulder to shoulder as they arrived early for refreshing beverages, food, and the opening entertainment. Kicking off the night's show was a local country band from West Alexandria, OH called The Justin Bryan Band. The Justin Bryan Band is made up of Justin Bryan on lead vocals, Ryan Wolfe on vocals and guitar, Chad Schrock on vocals and guitar, Travis Nichols on Bass and Dustin Crank on drums. The band would get the crowd energized during their opening set playing many of today's top country hits with a Justin Bryan Band original or two. You may check out the Justin Bryan Band on Facebook at https://www.facebook.com/justinbryanband/timeline. After the opening band got the crowd warmed up and rowdy, it was time for Dayton, OH native Alexis Gomez to take the stage. Alexis is known from American Idol's season 14 as a top 16 finalist only to be eliminated during Motown week where she performed "I Can't Help Myself (Sugar Pie Honey Bunch)". Alexis put on a fun performance filled with covers and originals of her own that kept the crowd entertained and cheering. Alexis was backed by a talented group of musicians including: Sol Gomez on Back-up Vocals, Michael Gomez on Bass Guitar, Morgan Gomez on Back-up Vocals, Jake Ittel on Electric Guitar, Dave D'Aurora on Drums, and Tom Lees on Electric Guitar. Alexis put her own spin on country favorites such as Little Big Town's 'Pontoon', Darius Rucker's 'Wagon Wheel', Martina McBride's 'Independence Day' and many others as well as an original titled 'Country Lovin'. Alexis is performing at various events throughout the Dayton, OH area so please check out her official website for more details at www.alexisgomezmusic.com. Now that the opening bands had the crowd ready to go, it was Clint Black's duty to seal the deal on the night. The house lights dimmed and a quiet excitement took over the room as Clint's band took to the stage. The crowd packed in tightly as the fans inched closer to the stage for a better view of this country legend. Mr. Black come onstage with a charming smile on his face, harmonica around his neck and a red white and blue American flag guitar displaying his patriotic side. The sound was fantastic as he played through the biggest of his hits of his discography which spans a career of 25+ years. The fans were loud as they stood with their toes buried in the sand, turtle necking over anybody in front of them just to get a better glimpse. Looking out from the VIP deck/club level, it was a sea of people from the left to the right and from the front of the stage to the rear of the venue. This place was packed! Country radio, take a more than obvious hint, people still like traditional country music and tonight more than proved that point. One of my personal favorite moments during the show was when Clint introduced a song from his D'lectrified album called 'Are You Sure Waylon Done It This Way' which is a spin off of Waylon's 'Are You Sure Hank Done It This Way'. Clint told the crowd of meeting with Waylon about the song and sitting in the same room was Kris Kristofferson, talk about being in good company! There was never a dull moment. Just one of those many exciting moments was when Clint laid his guitar down during "Been There' and got the crowd involved in a harmonica sing along. Yes! A harmonica sing along! At the end of the song, Clint broke things down with an energetic harmonica solo encouraging the crowd to sing back the harmonica part during the breaks. Clint says to the crowd "You have to sing Harmonica!" Following the sing along, Clint began a bluesy harmonica intro to 'Put Yourself In My Shoes" and then finished up with some amazing guitar picking during 'Nothin' But The Taillights." The crowd was relentless with their cheering and applause that Clint had no choice other than to return to the stage for an encore which featured 'We Tell Ourselves' and then left crowd in a frenzy with 'All Tuckered Out'. Clint doesn't need a lot of theatrics in his show to prove he certainly has a stage presence like no other. The precision of the notes and licks played on his guitar combined with his skill on the harmonica and one of the most recognizable voices in country music is more than enough to keep an audience captivated for many hours. Dayton and Cincinnati are sure glad that Clint Black took the time to come and play for them. For more information on tour dates, music and merchandise please visit www.clintblack.com. You can also get social with Clint on Facebook, Twitter at @Clint_Black and on Instagram! Loved the opening band. They rocked!!! !